TensorFlow is one of the most popular open source libraries in the Machine Learning and Deep Learning community. We see breakthroughs in diverse fields on a weekly basis and more often than not, TensorFlow is at the heart of the final model. Since it’s release, the TensorFlow team has continuously worked on improving the library by making it simpler and interactive for the users. 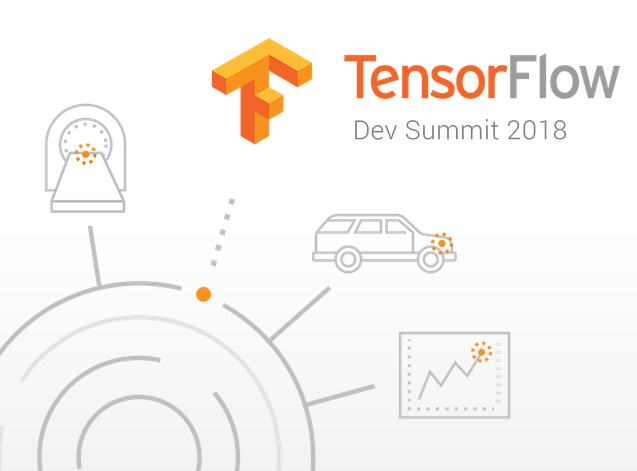 TensorFlow Developer Summit is an event that brings together TensorFlow users from all over the globe to see all the new products, tools, libraries, and use cases presented by the TensorFlow team and industry leaders. After receiving an overwhelming response to the first TensorFlow Developer summit conducted in 2017, this year’s TensorFlow Developer Summit was held on March 30th 2018, at the Computer History Museum in Mountain View, CA. More than 500 TensorFlow users attended the summit and thousands others connected via a live stream . The Summit had many exciting announcements, demos and tech talks. Below we have provided the highlights from every session presented at the summit. Astrophysicists and Engineers use machine learning to analyze data from Kepler mission, and have discovered a new planet Kepler 90i. In Healthcare, TensorFlow and machine learning techniques are used to determine a person’s risk of cardiovascular (CV) diseases by analyzing the retina scans. You can read more about it here. Air traffic controllers and engineers in Europe are using TensorFlow to predict flight trajectories to ensure safe landing. Machine learning, along with deep neural networks, learn characteristics of sound and create new music. TensorFlow contains a full implementation of keras. tf.keras contains building blocks to build models and offers utilities to train them as well. 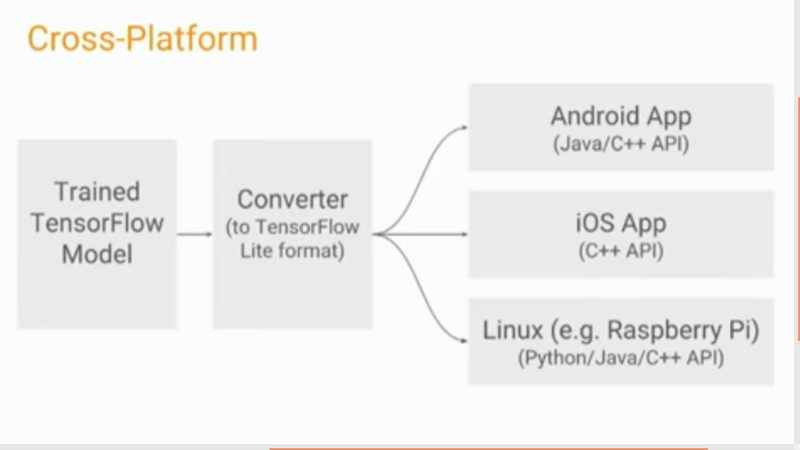 Taking the discussion forward, Megan Kacholia, Engineering director at Google Brain, introduced the latest update to TensorFlow Lite that let’s users work on any platform, like CPU, Android or iOS. She also mentioned the various platforms TensorFlow works on, which now includes Cloud TPU. A beta version of cloud TPU was launched in February and it provides 180 teraflops of computation per device. Have a look at the Reference models and tools for Cloud TPUs here. Jeff Dean, leader of the Brain team talks about how TensorFlow addresses real problems, focusing on Advance health informatics and Engineer the tools for scientific discovery. The main idea is to make machine learning easier to use and replace ML expertise with computation. tf.data is a new library that helps users get all of their data into TensorFlow. It works as an input pipeline. Derek Murray introduced the tf.data library and talked about its performance. He explained in detail about the flexibility, ease of use and speed that it provides. Derek also announced the launch of a performance guide for tf.data on the website for users. You can watch the complete talk here. Focusing on making TensorFlow simpler to use, the team introduced an intuitive programming model, Eager Execution. With Eager Execution, the distinction between the construction of execution graph can be removed. Thus, one can now use the same code to generate the equivalent graph for training at scale using the Estimator high-level API. This was launched in the TensorFlow 1.5.0 update which we covered here. Alexandre Passos, Software Engineer at TensorFlow, talks about eager execution in detail along with a demo code in the following video. In this talk, Brennan Saeta provided an overview for users on how to optimize training speed of their models on GPUs and TPUs. Starting with an introduction to the ML training loop, he further spoke about improving the performance following three basic steps: Find Bottleneck, Optimize Bottleneck and repeat, and he also provided a few pointers about it’s future impact. Mustafa Ispir spoke about high level APIs and how these can be used by ML practitioners for performing modeling experiments, with just a few lines of code. He explained, with a case study, how high level APIs can be used to be more efficient and effective. The discussion was mainly focused on High Level APIs built for each step in a ML pipeline. Briefly summarizing, APIs are built for the Estimators, Features, Premade, Modeling, Scaling and Serving. Distributed TensorFlow is a method by which the models can train faster and work parallely. Igor Saprykin in his talk discussed the different ways to train a model on a single machine and multiple GPUs. The tf.contrib.distribute is a module that handles distributed computing in TensorFlow. It uses all-reduce on multiple GPUs to perform In-graph replication with synchronous training. To make debugging models easier, the TensorFlow team has released a new interactive graphical debugger plug-in as part of the TensorBoard visualization tool. In the following video, Justine Tunney and Shanqing Cai give a demo of the TensorFlow Debugger. It will help the user inspect, set breakpoints and step through the graph nodes in real time. This was definitely one of our favorite things from the conference! Starting with a brief talk on nuclie fusion and plasma, Ian Langmore explained how Google and Tae together reconstruct plasma attributes on the basis of measurements, using Bayesian Inference. This is a Bayesian inverse problem and it uses TensorFlow’s distribution and tensorflow_probability libraries. Cory McLean, Engineer in the Genomics Team at Google Brain, announced the launch of Nucleus, a Python library for reading, writing, and filtering common genomics file formats for conversion to TensorFlow examples. In his talk, he gave a basic introduction on genomics and opportunities for deep learning in this field. Furthermore, he spoke about Nucleus’ interoperable data representation with Variant Transforms, an open source tool from Google Cloud. Edd Wilder-James gave a brief talk on the TensorFlow community. 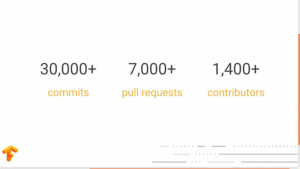 He shared the number of users and contributors of TensorFlow which, as you can see is the image below, is further evidence of the growth of the TensorFlow community. With the new additions and improvements in TensorFlow, he expects the numbers to increase rapidly. Here is the video where Edd talks how they are planning to engage and collaborate with their users. Swift for TensorFlow (TFiwS) is an early stage open source project with the aim to improve usability of TensorFlow. It has many design advantages, and will be released with technical whitepaper, code, and an open design approach in April 2018. The Swift for TensorFlow team strongly believes that Swift could be the future of data science and machine learning development. TensorFlow Hub, a built-in library, is launched to foster the publication, discovery, and consumption of reusable parts of machine learning models. 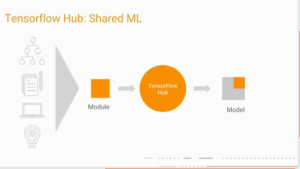 Jeremiah Harmsen and Andrew Gasparovic explained how TensorFlow Hub let’s you build, share and use Machine Learning modules. This can be easily integrated into your model with a single line of code. You can look at the below image for a better understanding of this and visit their blog. 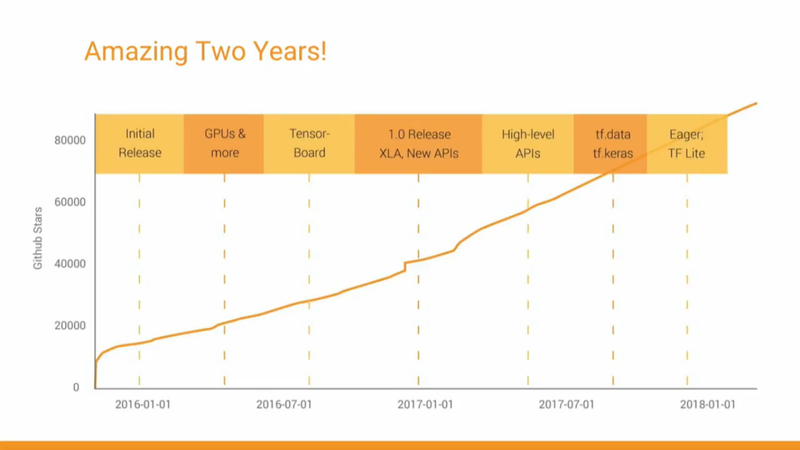 Clemens Mewald and Raz Mathias announced the roadmap for TensorFlow Extended (TFX), which is an end-to-end ML platform built around TensorFlow. Also, TensorFlow Model Analysis (TFMA), a library to visualize evaluation metrics, was launched. Here is the video where a demo of the same has been presented. Have a look! Addressing real world research problems, Alex Irphan from the Google Brain Robotics Team, explained his approach to solve the problem. The problem setup was: neural network commands a robot arm to grasp objects. The robotics team combined feature level domain adaptation and pixel level domain adaptation to train the model. You can watch the video below to understand how the simulators and other ML techniques are used to reduce the amount of real world data required. Project Magenta is a smart tool that allows artists to create music using pre-trained models. Sherol Chen in her talk explaied how these models can be tuned and controlled. She also presented a glimpse of this on a keyboard, while tuning the outputs. The combination of music and machine learning is always a positive and has been well received by the TensorFlow community. There were quite a few new things launched at this year’s summit. 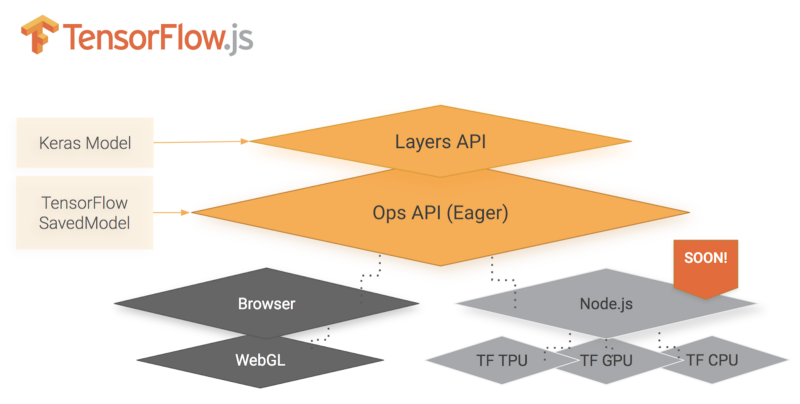 While we had already seen Eager Execution before, new tools and libraries like TensorFlow.js and TensorFlow Model Analysis were introduced and will surely be incorporated into ML models soon. You can watch the full live stream of TensorFlow 2018 here! What did you find most exciting about this summit? Let us know your thoughts and feedbacks in the comments below! Thank you for compiling and sharing really exciting field of tensor Flow . Cool list. The loyalty program software in particular caught my eye. This type of software automation doesn’t reduce the value of the loyalty program from Coco-Cola’s perpsective right? Does it increase the value because the data is more reliable?